I apologize that I've been AWOL for the past two days. I had 25 people for dinner Wednesday night. I had a class, three concerts and a play to attend yesterday. I was home for a total of 1.57 hours yesterday. Today--today is Tucker's 21st birthday. I just made bacon mac for his birthday lunch. All his high school friends are getting together here to celebrate, just like they did every Monday of their senior year--read about that here. We have another recital tonight, along with birthday cake and presents. Next week, I promise to find time to edit the photos and video and write all about Tucker and his entrance back into our lives. For now, just a few pictures. First, what we all looked like when he left. And what we all looked like at the airport on Wednesday. Notice how much Lily grew over two years' time--and that she's holding Heidi on the iPad so that we could all be there (yes, Lily is on crutches--tumbling injury. She's mending). And notice Ben--we are going to officially measure Ben against Tucker and Lily against Heidi this weekend. I think both younger siblings may have height bragging rights. Although many of the photos from Wednesday are out of focus, here is the one I was waiting for. All seven of my chicks are back under my roof for the first time since December 2010. We all read scriptures in the family room this morning and then they all lined up at the kitchen island for french toast, and I couldn't help but count today as another' Mother's Day. I haven't stopped smiling for two days. I fully expect it to continue all weekend. Happy family! I am amazed at the difference in the two photos, Lily has grown up so much! Funny how you don't notice the day to day changes, but seeing these side by side really shows how much two years changed everyone! I am crying because I am so happy for you and I look forward to those moments too. Thank you for sharing. So happy for you and your family. So glad he arrived home safely. Happy is a good place to be! Awww YES! This is the post I've been waiting for! So so so happy for you, Jen. 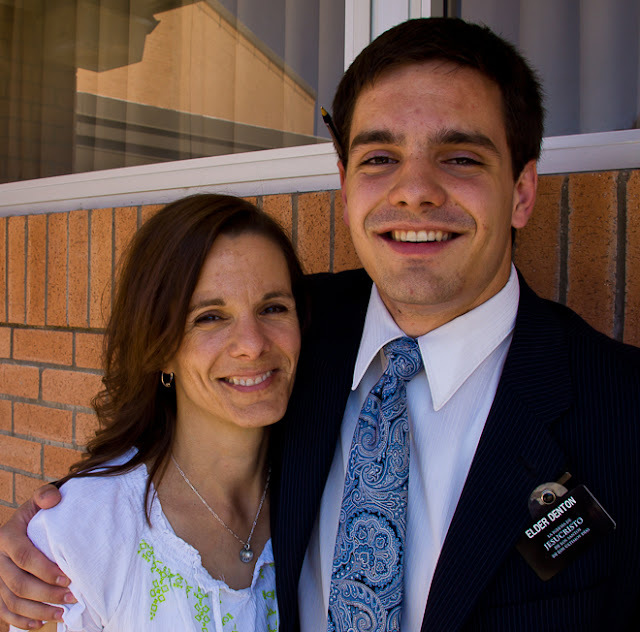 Well done, Elder Denton! Beautiful pictures, Jenny!! Love the glow! Don't apologize for going AWOL!! You need to enjoy your time with your family! Everyone is home! Yay! 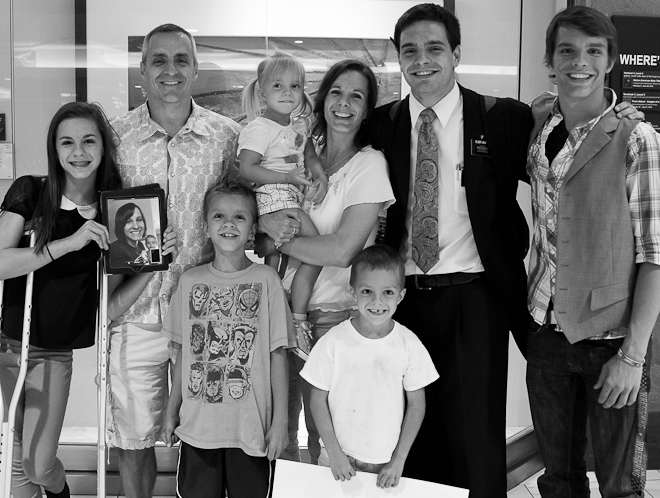 I'm so incredibly happy for you :) You are so incredibly blessed to have such a wonderful loving family. So happy for you all. Congrats. Not much of a better feeling. Yep, BEST day EVER! Love all the pics, you all look great, and happy! Could a mother's heart be any more full?